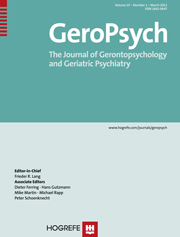 Special Issue "GeroPsychology across Europe"
The already announced special issue of "GeroPsych-The Journal of Gerontopsychology and Geriatric Psychiatry" published in the journal's September release provides interesting insights into geropsychology across Europe. A first section of the issue is dedicated to reports on intervention approaches and research in geropsychology describing new trends and providing insights into a flourishing field from various national perspectives. A second part provides four national reports giving an overview of the developments, research, and education in the field of geropsychology in Austria (Auer & Gatterer), the Czech Republic (Stepankova et al), Germany (Wurm & Tesch-Römer), and Spain (Santacreu Ivars). The series will be continued. Frieder Lang will present a statement on "Psychological contributions to healthy ageing and longevity"
On 1 and 2 June 2012, Geropsychology scholars, from 11 countries, flocked to Chateau de Schengen, Luxembourg, for a unique European workshop on healthy and active ageing, organised by the Standing Committee on Geropsychology together with the Research Unit INSIDE of the University of Luxembourg. The workshop brought together experts in Geropsychology across Europe, exchanging research activities and best practice examples about promoting active and healthy ageing. In particular, scholars exchanged the latest findings in active ageing research, intervention programmes to promote active and healthy ageing, as well as training and teaching practices in the area of Geropsychology. Guest speakers included members of all 11 countries; Austria, Croatia, Czech Republic, France, Germany, Greece, Luxembourg, Norway, Spain, The Netherlands and Turkey. Invited guests and further contributors comprised: Robert Roe, President of the European Association of Psychologist's Association, Gilles Michaux, President of the Luxembourg Psychological Association, Franco Fraccaroli , the convenor of the European Association for Work & Organizational Psychology, Giovanni Lamura, distinguished ageing researcher and vice-president of Eurocarers, and Jean-Pierre Baeyens, chairman of the newly-formed European Nutrition for Health Alliance. Jaan Valsiner, renowned scholar in developmental psychology and cultural psychology, particpated as guest from the USA. As national experts, the group welcomed Martine Hoffmann (Center fir Altersfroen, Luxembourg), Thomas Boll (University of Luxembourg), and Fernando Ribeiro, national coordinator of EYAA 2012 (Ministère de la Famille, Luxembourg).